There were signs over the past two days that the meeting was going well compared to earlier rounds. The lack of aggressive Iranian posturing as the meeting got underway Tuesday hinted that Iranian negotiators may have been persuaded that the revised P5+1 proposal had moved at least some way to respond to their concerns, including in offering some sanctions relief, and that they should at least agree to study and discuss it further. 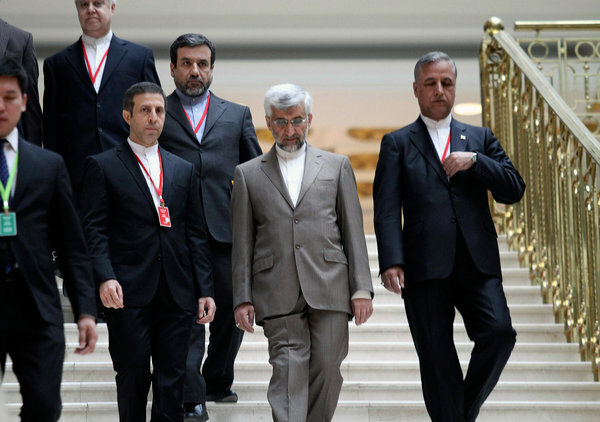 By the conclusion of talks Wednesday, it was evident that Iran had decided to spin the updated offer as a diplomatic success for Tehran, that responded to an Iranian proposal presented at a meeting in Moscow last June. Also notable, the Iranian delegation did not hang posters of assassinated Iranian nuclear scientists on the podium before Jalili's press conference, as it had at several earlier rounds. Earlier in the week, on the eve of talks, Western diplomats said they would like to come to agreement here on a follow-on meeting, or series of meetings, at the expert level. A meeting of non-proliferation experts held last July in Istanbul was productive and involved more US-Iran interactions, American officials said Monday. Lead US negotiator at the talks, Under Secretary of State for Political Affairs Wendy Sherman, travels Thursday to Israel, Jordan and Saudi Arabia to brief Middle East allies and GCC states about the Iran consultations and other matters. This entry was posted in Politics, Security and tagged Ali Bagheri, Britain, Catherine Ashton, China, enrichment, European Union, Fordo, Fordow, GCC, Germany, IAEA, Iran, Israel, Jordan, Kazakhstan, P5+1, Rasoul Movahedian-Atar., Russia, Saeed Jalili, sanctions, Saudi Arabia, Simon Gass, Turkey, United States, Wendy Sherman by Laura Rozen. Bookmark the permalink.